Yeah, and most of the "bottled" water is just tap water put into bottles. total waste. I don't buy into bottled water but if I feel I am somewhere where drinking water is dodgy, I would buy a bottle, but otherwise not. So many chemicals leak into the water from the plastic and I wonder how many people give that thought. I stopped buying bottled water a while back. 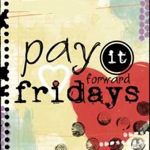 Good to hear that you made a Pay it Forward button... I will start this Friday! What a great post. I'd seen this some months ago and forgotten about it. Will have to add to my blog at some point. Feel very lucky that I capture my own rainwater to drink. Great post, so glad I watched that video and read your post. I spend $6 every week on bottled water, no more, I'll use tap. Thanks for the post. Nope, no bottled water here, such a foreign concept to pay for water?!?!? Love the video!